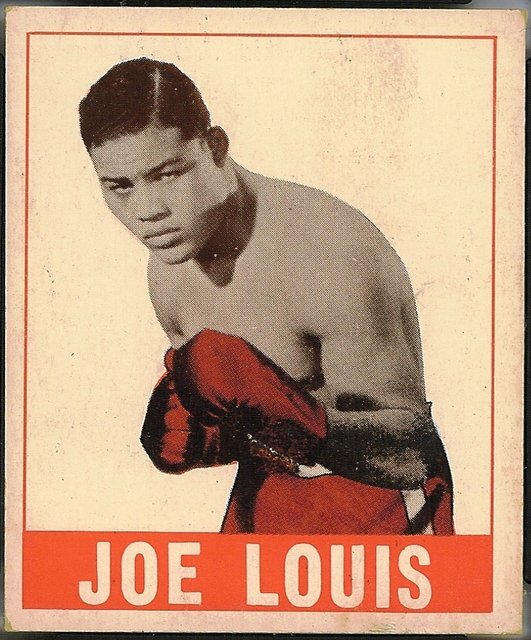 1948 Leaf Joe Louis. Printing quality is the biggest condition concern with 1948 Leaf cards. The card stock itself is fairly thick and holds up well, but the printing can vary from atrocious to breathtakingly nice. Front image registration is the single worst problem with the set. The set was printed in three passes -- black, red and blue – and relatively few of the cards actually align perfectly for all three phases. When the printing lines up exactly, the result is a crisp, sharp image and a very nice card indeed, but if any phase misses the mark by even a millimeter, the entire image is thrown off. Many collectors of this issue will sacrifice corner sharpness or centering to get a properly printed card. The card fronts also suffer from inking irregularities.